Mara Keisling, executive director of the National Center for Transgender Equality, also blamed Republicans for the failure to advance ENDA in the Senate. She also cited what she called a “general dysfunction” in the chamber as a problem. That’s not what I’ve been hearing. On the one hand, it truly is hard to find fault with The John for, at least on principle, not believing things that emerge from the Head Quack at the Quisling Quacktory. On the other hand, “Thats not what I’ve been hearing” sounds more than a little bit like the (if it wasn’t, then it should have been) patented “Some say…” trick of Fox ‘News’. And, when one considers the gay-first-including-gay-marriage-and-yes-that-means-that-you’d-better-not-suggest-that-incremental-progress-applies-to-gay-marriage greed mentality of those who share space in The John’s echo chamber, I can actually believe that all he’s been hearing is how ‘that e-vul trans-scum’ is mussing up ‘their’ ENDA. I surfed over to this Fangoria page from a post by Kelli Busey – a post that I’d hoped was a satirical sequel to my Myra Breckinridge Luna-Tick post. One of the most controversial films shown at New York’s Tribeca Film Festival earlier this year was TICKED-OFF TRANNIES WITH KNIVES, a horror-revenge film that ticked off certain members of the transgendered community itself. Now it’s poised to provoke some more, as it has a North American distributor. Breaking Glass Pictures gave Fango the scoop that it has acquired the rights to the movie, and plans theatrical screenings during the Halloween season, followed by DVD/video-on-demand release in November. Make sure that your community’s DOR observance is the first to include a screening of a film that, whether any of the Luna-Tick’s conspirators and/or apologists acknowledge it or not, is designed to encourage violence against trans women! The provisions of the Gender Recognition Act 2004 that over-rode that 1975 act have now been repealed. 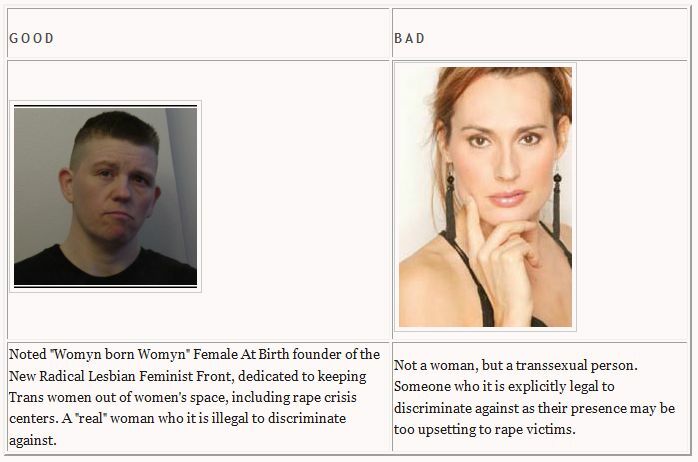 There is a distinction between “women” and “transsexual persons with (or without) gender recognition certificates” now. Okay, so Zoe and I have different qualitative assessments as to what is worth a piece of paper and what is worth less. Where is my ‘Alix Dobkin Cassette’ suppository? Oooooooooohhhhhhhhh, but its the Kweeeeeeeeeeeerrrrrrzzzzzzzzzz who are evil, eh? Memphis city council member Janis Fullilove has received multiple death threats related to her efforts to ban discrimination against gays in city government. Police think the threats are serious enough have increased patrols around her home to keep her safe. All four calls came Tuesday and each call mentioned the proposed employee non-discrimination ordinance. Someone also threw a dead cat on her lawn. Each phone call mentioned her support for banning discrimination against gays in city government. Distraught, Fullilove reached out to Jonathan Cole with the Tennessee Equality Project. Tennessee stand up to theocratic fascists? I’m not holding my breath. Why Can’t the MSM be This Honest and This Direct? Its the MSM after all. News a priority? Not over profits. “Sentiment may be slow to improve until companies start adding to payrolls at a faster rate, and the Federal Reserve projects unemployment will take time to decline. Today’s figures showed income expectations at their lowest point in more than a year, posing a risk for consumer spending that accounts for 70 per cent of the economy. Confidence is falling because unemployment is soaring, because the media is lying, and because the Fed’s monetary policy has failed. Notice that Bloomberg does not mention consumer worries over “curbing the deficits”. In truth, the public has only a passing interest in the large deficits. It’s a fictitious problem invented by rich corporatists (and their think tanks) who want to apply austerity measures so they can divert more public money to themselves. In the real world, consumer confidence relates to one thing alone–jobs. And when the jobs market stinks, confidence plummets. How long would Brian Williams keep his job if he spoke this reality on the Help General Electric Keep Its Defense Contracts Nightly Propaganda Dose? Why Does Anyone Interview Log Cabin Republicans About Anything? R. Clarke Cooper, executive director of the Log Cabin Republicans, dismissed the notion that Republicans were holding up ENDA in the Senate and said “only the current Senate majority leadership can truly answer” why ENDA isn’t on the calendar. How about just going ahead and interviewing Tony Perkins and Lou Sheldon for some more ‘balance’, eh QCM? Its bad enough that QCM interviewed Quisling McNothingburger – as if that head of the Quisling Quacktory speaks for any trans lifeform outside of the Court of the Quimson Quisling – but a clown from an organization that is inherently a joke (as opposed to the Quisling Quacktory; after all, in theory, an organization with ‘transgender equality’ in its name only becomes a joke via Quisling Contwowl)? Is Chris Crain back on the payroll? You are currently browsing the ENDAblog blog archives for July, 2010.